Spicy Shankarpali is such a crispy and crunchy snacks suits incredibly for diwali savories.Spicy Shankarpali also surprises people as people associate shankarpali with sweetness. 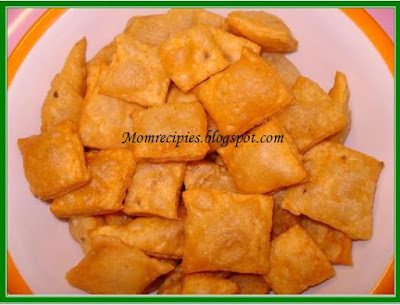 This is a different kind.They are crunchy and an excellent accompaniment with tea or coffee.Kids will also love this.My Kiddo liked it.These were a favorite of my family.Its easy and tasty. In a big bowl take the flour. Add salt, turmeric powder, caraway seeds, sesame seeds.,cumin seeds. Coarse crush green chilies in mortar and pestle. Add the crushed chilies to the flour . Heat 1 tablespoon oil and pour it over the flour . With a spoon mix the flour. Do not do it with hand as it may cause a burn. Then add the water and knead a tight dough but smooth dough. Let it rest for atleast an hour. Later roll out chapatis thicker than normal, cut into diamond shapes or shapes of your choice with a knife or cookie cutters or pizza cutter.Do not stack the pieces one above other. Separate each cut and fry in hot oil till golden. When they are cooled to room temperature, store in air tight container.These taste like spicy biscuits. You can add handful of curry leaves and coarse it with green chillies and add to flour. perfect crispy and crunchy snack dear. 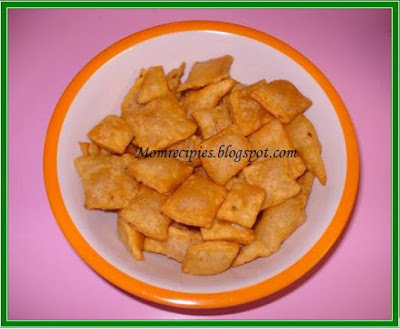 Wow feel like munching these crispies rite now..looks delicious! wow, i love these spicy ones. good combination hot tea in the evening. That is a delicious snack for tea! yummy..i am going to make this soon.. Yummyyyyy!!!! I have an award waiting for you in my blog. Pls pick it. crispy snack . I love this.We used to add red chilli powder. Perfectly crispy they turned out.Hope you had a happy and safe Diwali. Has come out so perfect in shape and color... looks yummy. Looks very crispy and crunchy Sireesha, got very nice color!!! collect ur awards from my blog dear. Looks delicious ! Belated Diwali wishes to you and your family ! Looks cripy and yummy. Yummy snack.